No one really knows for sure the origin of this dish (traditionally made with chicken) or who conceived it. General Tso, a 19th-century general from the Chinese province of Hunan, and a famous personage at the time, apparently enjoyed eating this dish so much it was said to be named after him. 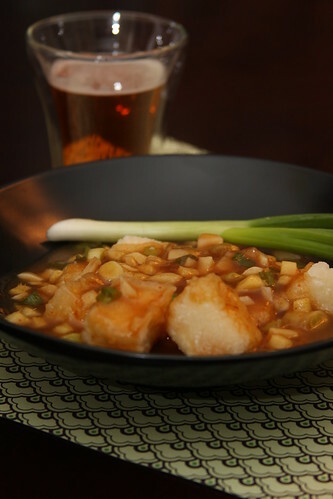 But another Hunanese, Chef Peng, is said to have created this dish himself in the 1950s. Despite the vagueness of its origin, one thing is certain: this dish is fantastic. Heavy, crisp, sweet and garlicky, its a perfect weekend dinner when you just want to have something hearty and stay at home and relax. This recipe has been adapted from vegweb‘s version. I’m not sure why, but once this dish is ready, you’ll have to wait around for it to cool off—it maintains a molten lava temperature for about 15 minutes even after its been plated. But its worth the wait. Place a large shallow pan over medium high heat. Place enough oil in the pan to fill it halfway. While you are waiting for the oil to heat, set up a station of three shallow, wide bowls with the tofu, Ener-G and cornstarch. You can tell when the oil is ready by inserting a wooden spoon into the oil—if bubbles form around the spoon, you can begin frying. About five pieces at a time, dunk the tofu into the Ener-G, and then place in the cornstarch. Cover the pieces with the cornstarch, tapping off any excess before placing into the pan. Repeat this process until you have all of the tofu cubes frying in the pan. While you are waiting for the tofu to fry (anywhere from 10-12 minutes on each side), begin making your sauce. In a small saucepan, saute the scallions, ginger and garlic in a bit of oil over medium heat, just until you can smell it, about 4 minutes. Then, turn the heat up to medium high for one minute, and then add the mirin and heat for 1 minute more. Add the broth and then the soy sauce, sugar, vinegar and habenero. Your tofu should now be ready to turn. Using tongs, flip each piece over and let it fry for 10-12 more minutes. Return to your sauce. Take some of the leftover cornstarch (about 2-3 tablespoons, and mix with about 5-6 tablespoons of water in a small bowl until it is fully disintegrated. Add that mixture to your sauce, stirring immediately. It should instantly thicken. Once desired consistency is achieved (it shouldn’t be watery or too viscous), remove it from the heat and return to your tofu. Once both sides of the tofu are golden brown, remove from the oil and drain on paper towels. Either toss the cubes in the sauce and serve or spoon the sauce over the top. oh my, always good! I remember this recipe taking vegweb by storm a few years ago. I like your addition of habanero powder – meyow! holy crap, i just made this and it AMAZING – very very simple, yet super tasty. may i have your permission to repost this on my vegan cooking blog? Yum, yum, yum! I made something similar awhile back (I called it Tangelo Tofu!). Thanks for sharing! VegNews Magazine | The Summer Issue!